It's still dangerous to push the boundaries in Saudi Arabia. That's exactly what animation studio Myrkott is doing, and it's building a huge online following in the process. Myrkott and its creators are behind the wildly popular satirical cartoon series, Masameer. Named after a Saudi neighborhood about 186 miles (300 km) west of the capital Riyadh, the series pokes fun at the conservative kingdom over issues such as women's rights, corruption, drug use and religious tension -- subjects that would have been taboo until very recently. The series has so far amassed more than 600 million views over 100 episodes on YouTube. "We try to create characters from all aspects, all different backgrounds, cultures, religions. 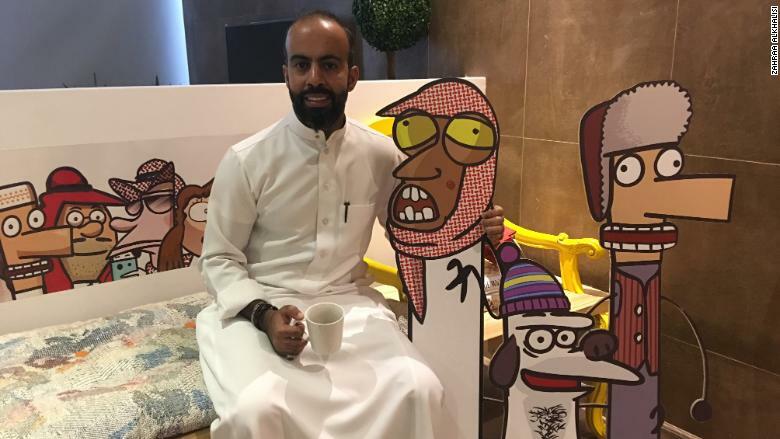 Characters that you meet everyday," said Abdulaziz Al-Muzaini, who founded Myrkott with Malik Nejer and Faisal Alamer in 2014. "When you watch it as a Saudi or from the Gulf, there is a certain depth of reality... that makes people love it," he told CNNMoney. Masameer also tackles other dramatic changes being driven by Crown Prince Mohammed bin Salman, who wants to overhaul the economy and restore a more tolerant culture to Saudi Arabia. A recent 12-minute episode covered recent reform efforts and the struggle with religious authorities who oppose steps to liberalize society, such as allowing music concerts for the first time this year. It features a man who runs out of patience with the lack of change, and decides his only option is to escape what he calls the "medieval" kingdom, leaving his wife in the process. He starts a video blog about his new "freedom" and his desire to try things that are forbidden in Saudi Arabia. "Tomorrow I'll think about being an atheist, then become part of an opposition, then try being gay," he says in a video that was cut short for an announcement claiming women will be allowed to drive. That prompts him to return to Saudi Arabia. The episode has been watched more than 1.7 million times. But Al-Muzaini knows it won't be universally popular. "We know that not all people are going to take it well," Al-Muzaini said in his studio in Riyadh. "We don't want to follow, we want to lead. We want to go on five years from now and say 'we told you so.'" The risks of going too far too fast were underscored earlier this month. The head of a government agency was fired after he attended the opening party of an academy to train women to become beauticians. Models at the event in Riyadh were dressed conservatively, but were unveiled and were wearing makeup, a scene that would have been almost unthinkable a few months back. Social media sites were abuzz following the event. "The kingdom and its men does not approve of this irresponsible act," tweeted one Saudi user. "This is out of our norms and traditions," tweeted another. Al-Muzaini believes changing the way young people think is vital if the country is going to move forward. Getting more of them into work is a key part of bin Salman's Vision 2030 for what the economy, and the country, should look like. "The vision is not about the money, it's not about who you put as a leader, it's rather about the mentality of the people," Al-Muzaini said. "The vision is not going to happen with the same mentalities that we have these days." He hopes that the reforms will allow the media sector to flourish and contribute to the economy. Saudi Arabia this week lifted a 35-year ban on cinemas. It expects the first movie theaters to open in March. The news has prompted Mykrott to consider bringing Masameer to the big screen by the end of 2018. Beyond creating a YouTube sensation, most of the work at Myrkott is making videos for companies. It also generates revenue from sponsorships and advertisements. Al-Muzaini started out as a newspaper cartoonist in the 1990s. Then print media went into decline. "I knew I had to find another way of practicing what I love," he said. "That's when I met Malek [my co-founder] and he showed me that my drawings can be animated." Al-Muzaini recalls the first time one of his videos hit a thousand views. "It's like my whole school watched my video," said Al-Muzaini. "We were like wow, amazed... These days we create millions and millions of views."